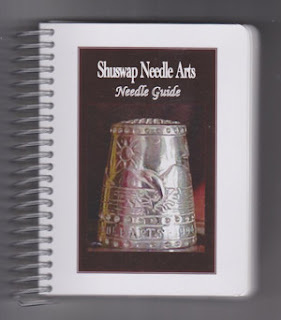 Shuswap Needle Arts Guild will be bringing copies of their needle guide to Seminar 2018: Bridging Stitches/Un pont entre les points in July. This little book is attractively laid out with various types of needles and a description of their use. The book covers ball point needles to tapestry needles, with eleven in between! The left page shows images of the needles along with a description and use. The right page has an attached piece of felt for needle storage, and underneath, a list of needle sizes and the threads used with those. They have a limited number of copies each cover - with the guild's 10th anniversary silver thimble or the S.N.A.G. logo. You can pre-order your needle guide by email. Be sure to note which cover you want, your name and the name of the person who will be picking your up during seminar.